We’ve scoured the Letters of Note archives once again, this time for notes from men who would hold or were holding the highest office in the land. Here are ten of our favorite letters from the presidents. 1. "Liberty-loving people everywhere march with you." General Eisenhower’s Order of the Day on June 5, 1944, was a call-to-arms for members of the allied forces before they would begin a two-pronged assault under the codename Operation Neptune. 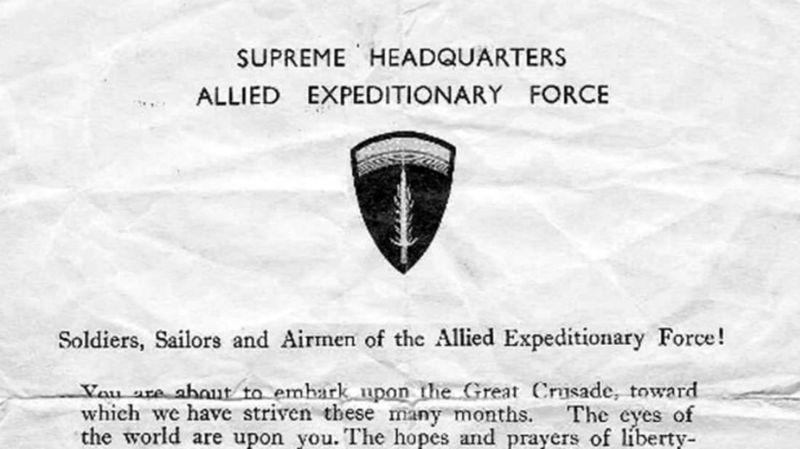 As sailors and soldiers geared up for D-day, the following letter was distributed just hours before they landed in Normandy. Eisenhower wouldn’t be president for another nine years, but the letter stands as one of the most important military documents in history. 2. "I would have empty pockets and nothing to gain." As a new Boy Scout, 10-year-old John Fitzgerald Kennedy knew better than anyone that success is not cheap. His weekly allowance of 40 cents just couldn’t cover the costs of basic survival gear, and so the future president wrote this no-nonsense letter to his father to request an increase in funds. My recent allowance is 40¢. This I used for areoplanes and other playthings of childhood but now I am a scout and I put away my childish things. Before I would spend 20¢ of my ¢.40 allowance and in five minutes I would have empty pockets and nothing to gain and 20¢ to lose. When I a a scout I have to buy canteens, haversacks, blankets, searchlidgs, poncho things that will last for years and I can always use it while I can't use a cholcalote marshmellow sunday with vanilla ice cream and so I put in my plea for a raise of thirty cents for me to buy scout things and pay my own way more around. 3. "What I want you to know as a father is this." On New Year's Eve of 1990, then-president George H. W. Bush was just returning from Camp David, where he’d spent the holidays with his family and worried over the mounting tensions in Kuwait during operation Desert Storm. He sent the following letter to his wife and kids shortly afterward. First, I can't begin to tell you how great it was to have you here at Camp David. I loved the games (the Marines are still smarting over their 1 and 2 record), I loved Christmas Day, marred only by the absence of Sam and Ellie. I loved the movies- some of 'em- I loved the laughs. Most of all, I loved seeing you together. We are a family blessed; and this Christmas simply reinforced all that. I hope I didn't seem moody. I tried not to. When I came into this job I vowed that I would never ring my hands and talk about "the loneliest job in the world" or ring my hands about the "pressures or the trials". Having said that I have been concerned about what lies ahead. There is no 'loneliness' though, because I am backed by a first rate team of knowledgeable and committed people. No president has been more blessed in this regard.. I have thought long and hard about what might have to be done. As I write this letter at Year's end, there is still some hope that Iraq's dictator will pull out of Kuwait. I vary on this. Sometimes I think he might, at others I think he simply is too unrealistic- too ignorant of what he might face. I have the peace of mind that comes from knowing that we have tried hard for peace. We have gone to the uN; we have formed an historic coalition; there have been diplomatic initiatives from country after country. And so here we are a scant 16 days from a very important date- the date set by the uN for his total compliance with all UN resolutions including getting out of Kuwait- totally. I guess what I want you to know as a father is this: Every human life is precious. When the question is asked "How many lives are you willing to sacrifice? "- it tears at my heart. The answer, of course, is none- none at all. We have waited to give sanctions a chance, we have moved a tremendous force so as to reduce the risk to every American soldier if force has to be used; but the question of loss of life still lingers and plagues the heart. How many lives might have been saved if appeasement had given way to force earlier on in the late '30's or earliest '40's? How many Jews might have been sapred the gas chambers, or how many Polish patriots might be alive today? I look at today's crisis as "good" vs. "evil".... yes, it is that clear. - every human life is precious.. the little Iraqi kids' too. - Principle must be adhered to- Saddam cannot profit in any way at all from his aggression and from his brutalizing the people of Kuwait. - and sometimes in life you have to act as you think best - you can't compromise, you can't give in....even if your critics are loud and numerous. So, dear kids- batten down the hatches. Senator Inouye of Hawaii told me: "Mr. President, do what you have to do. If it is quick and successful everyone can take the credit. If it is drawn out, then be prepared for some in Congress to file impeachment papers against you"... that's what he said, and he's 100% correct. And so I shall say a few more prayers, mainly for our kids in the Gulf, and I shall do what must be done, and I shall be strengthened every day by our family love which lifts me up every single day of my life. I love you, Happy New Year and May God Bless every one of you and all in your family. 4. "Part of playing for high stakes under great pressure is the constant risk of mental error." It was April 5, 1993, and there were 11 seconds on the clock. Down by two in the NCAA championship game, Michigan star Chris Webber called a timeout. But Michigan had no timeouts left. Webber's mistake resulted in a technical foul that clinched the title for North Carolina. A few days later, he received this letter from President Clinton. I have been thinking of you a lot since I sat glued to the TV during the championship game. I know that there may be nothing I or anyone else can say to ease the pain and disappointment of what happened. Still, for whatever it's worth, you, and your team, were terrific. And part of playing for high stakes under great pressure is the constant risk of mental error. I know. I have lost two political races and made countless mistakes over the last twenty years. What matters is the intensity, integrity, and courage you bring to the effort. That is certainly what you have done. You can always regret what occurred but don't let it get you down or take away the satisfaction of what you have accomplished. You have a great future. Hang in there. 5. "If slavery is not wrong, nothing is wrong." "I am naturally anti-slavery. If slavery is not wrong, nothing is wrong. I can not remember when I did not so think, and feel. And yet I have never understood that the Presidency conferred upon me an unrestricted right to act officially upon this judgment and feeling. It was in the oath I took that I would, to the best of my ability, preserve, protect, and defend the Constitution of the United States. I could not take the office without taking the oath. Nor was it my view that I might take an oath to get power, and break the oath in using the power. I understood, too, that in ordinary civil administration this oath even forbade me to practically indulge my primary abstract judgment on the moral question of slavery. I had publicly declared this many times, and in many ways. And I aver that, to this day, I have done no official act in mere deference to my abstract judgment and feeling on slavery. I did understand however, that my oath to preserve the constitution to the best of my ability, imposed upon me the duty of preserving, by every indispensable means, that government -- that nation -- of which that constitution was the organic law. Was it possible to lose the nation, and yet preserve the constitution? By general law life and limb must be protected; yet often a limb must be amputated to save a life; but a life is never wisely given to save a limb. I felt that measures, otherwise unconstitutional, might become lawful, by becoming indispensable to the preservation of the constitution, through the preservation of the nation. Right or wrong, I assumed this ground, and now avow it. I could not feel that, to the best of my ability, I had even tried to preserve the constitution, if, to save slavery, or any minor matter, I should permit the wreck of government, country, and Constitution all together. When, early in the war, Gen. Fremont attempted military emancipation, I forbade it, because I did not then think it an indispensable necessity. When a little later, Gen. Cameron, then Secretary of War, suggested the arming of the blacks, I objected, because I did not yet think it an indispensable necessity. When, still later, Gen. Hunter attempted military emancipation, I again forbade it, because I did not yet think the indispensable necessity had come. When, in March, and May, and July 1862 I made earnest, and successive appeals to the border states to favor compensated emancipation, I believed the indispensable necessity for military emancipation, and arming the blacks would come, unless averted by that measure. They declined the proposition; and I was, in my best judgment, driven to the alternative of either surrendering the Union, and with it, the Constitution, or of laying strong hand upon the colored element. I chose the latter. In choosing it, I hoped for greater gain than loss; but of this, I was not entirely confident. More than a year of trial now shows no loss by it in our foreign relations, none in our home popular sentiment, none in our white military force, -- no loss by it any how or any where. On the contrary, it shows a gain of quite a hundred and thirty thousand soldiers, seamen, and laborers. These are palpable facts, about which, as facts, there can be no cavilling. We have the men; and we could not have had them without the measure. And now let any Union man who complains of the measure, test himself by writing down in one line that he is for subduing the rebellion by force of arms; and in the next, that he is for taking these hundred and thirty thousand men from the Union side, and placing them where they would be but for the measure he condemns. If he can not face his case so stated, it is only because he can not face the truth. I add a word which was not in the verbal conversation. In telling this tale I attempt no compliment to my own sagacity. I claim not to have controlled events, but confess plainly that events have controlled me. Now, at the end of three years struggle the nation's condition is not what either party, or any man devised, or expected. God alone can claim it. Whither it is tending seems plain. If God now wills the removal of a great wrong, and wills also that we of the North as well as you of the South, shall pay fairly for our complicity in that wrong, impartial history will find therein new cause to attest and revere the justice and goodness of God. 6. "To unite, or not to unite?" George Washington had just overseen the creation of the Constitution and was actively rallying for ratification when he wrote this letter to his nephew—a delegate for the Virginia State Ratifying Convention. Knowing that he had an opportunity to address objections from Antifederalists, the future first president wasted no space in his four-page argument. In due course of Post, I received your letters of the 19th & 26th Ult. ; and since, the one which you committed to the care of Mr Powell. I thank you for the communications therein, & for a continuation, in matters of importance, I shall be obliged to you. That the Assembly would afford the people an opportunity of deciding on the proposed Constitution I had hardly a doubt; the only question with me was, whether it would go forth under favourable auspices, or be branded with the mark of disapprobation. The opponents, I expected, (for it has ever been, that the adversaries to a measure are more active than its friends) would endeavour to give it an unfavourable complexion, with a view to biass the public mind. This, evidently, is the case with the writers in opposition; for their objections are better calculated to alarm the fears, than to convince the judgment of their readers. They build them upon principles which do not exist in the Constitution—which the known & litteral sense of it, does not support them in; and this too, after being flatly told that they are treading on untenable ground and after an appeal has been made to the letter, & spirit thereof, for proof: and then, as if the doctrine was uncontrovertable, draw such consequences as are necessary to rouse the apprehensions of the ignorant, & unthinking. It is not the interest of the major part of these characters to be convinced; nor will their local views yield to arguments which do not accord with their present, or future prospects; and yet, a candid solution of a single question, to which the understanding of almost every man is competent, must decide the point in dispute—namely—is it best for the States to unite, or not to unite? If there are men who prefer the latter, then, unquestionably, the Constitution which is offered, must, in their estimation, be inadmissible from the first Word to the last signature, inclusively. But those who may think differently, and yet object to parts of it, would do well to consider, that it does not lye with one State, nor with a minority of the States, to superstruct a Constitution for the whole. The seperate interests, as far as it is practicable, must be consolidated—and local views as far as the general good will admit, must be attended to. Hence it is that every state has some objection to the proposed form; and that these objections are directed to different points. That which is most pleasing to one, is obnoxious to another, and vice versa. If then the Union of the whole is a desirable object, the parts which compose it, must yield a little in order to accomplish it; for without the latter, the former is unattainable. For I again repeat it, that not a single state nor a minority of the States, can force a Constitution on the majority. But admitting they had (from their importance) the power to do it, will it not be granted that the attempt would be followed by civil commotions of a very serious nature? But to sum up the whole, let the opponants of the proposed Constitution, in this State, be asked—it is a question they ought certainly to have asked themselves; What line of conduct they would advise it to adopt, if nine other States should accede to it, of which I think there is little doubt? Would they recommend that it should stand on its own basis—seperate & distinct from the rest? Or would they connect it with Rhode Island, or even say two others, checkerwise, & remain with them as outcasts from the Society, to shift for themselves? or will they advise a return to our former dependence on Great Britain for their protection & support? or lastly would they prefer the mortification of comg in, when they will have no credit there from? I am sorry to add in this place that Virginians entertain too high an opinion of the importance of their own Country. In extent of territory—In number of Inhabitants (of all descriptions) & In wealth I will readily grant that it certainly stands first in the Union; but in point of strength, it is, comparitively, weak. To this point, my opportunities authorise me to speak, decidedly; and sure I am, in every point of view, in which the subject can be placed, it is not (considering also the Geographical situation of the State) more the interest of any one of them to confederate, than it is the one in which we live. The warmest friends to and the best supporters of the Constitution, do not contend that it is free from imperfections; but these were not to be avoided, and they are convinced if evils are likely to flow from them, that the remedy must come thereafter; because, in the present moment it is not to be obtained. And as there is a Constitutional door open for it, I think the people (for it is with them to judge) can, as they will have the aid of experience on their side, decide with as much propriety on the alterations and amendments wch shall be found necessary, as ourselves; for I do not conceive that we are more inspired—have more wisdem—or possess more virtue than those who will come after us. The power under the Constitution will always be with the people. It is entrusted for certain defined purposes and for a certain limited period to representatives of their own chusing; and whenever it is exercised contrary to their interests, or not according to their wishes, their Servants can, and undoubtedly will be, recalled. There will not be wanting those who will bring forward complaints of mal-administration whensoever they occur. To say that the Constitution may be strained, and an improper interpretation given to some of the clauses or articles of it, will apply to any that can be framed—in a word renders any one nugatory—for not one, more than another, can be binding, if the spirit and letter of the expression is disregarded. It is agreed on all hands that no government can be well administred without powers; and yet, the instant these are delegated, altho those who are entrusted with the Administration are taken from the people—return shortly to them again—and must feel the bad effect of oppressive measures—the persons holding them, as if their natures were immediately metamorphosed, are denominated tyrants and no disposition is allowed them, but to do wrong. Of these things in a government so constituted and guarded as the proposed one is, I can have no idea; and do firmly believe that whilst many ostensible reasons are held out against the adoption of it the true ones are yet behind the Curtain; not being of a nature to appear in open day. I believe further, supposing these objections to be founded in purity itself that as great evils result from too much jealousy, as from the want of it. And I adduce several of the Constitutions of these States, as proof thereof. No man is a warmer advocate for proper restraints, and wholesome checks in every department of government than I am; but neither my reasoning, nor my experience, has yet been able to discover the propriety of preventing men from doing good, because there is a possibility of their doing evil. If Mr Ronald can place the finances of this Country upon so respectable a footing as he has intimated, he will deserve its warmest, and most grateful thanks. In the attempt, my best wishes—which is all I have to offer—will accompany him. I hope there remains virtue enough in the Assembly of this State, to preserve inviolate public treaties, and private contracts. If these are infringed, farewell to respectability, and safety in the Government. I never possessed a doubt, but if any had ever existed in my breast, re-iterated proofs would have convinced me of the impolicy, of all commutable taxes. If wisdom is not to be acquired from experience, where is it to be found? But why ask the question? Is it not believed by every one that these are time-serving jobs by which a few are enriched, at the public expence! but whether the plan originates for this purpose, or is the child of ignorance, oppression is the result. You have, I find, broke the ice (as the saying is). one piece of advice only I will give you on the occasion (if you mean to be a respectable member, and to entitle yourself to the Ear of the House)—and that is—except in local matters which respect your Constituants and to which you are obliged, by duty, to speak, rise but seldom—let this be on important matters—and then make yourself thoroughly acquainted with the subject. Never be agitated by more than a decent warmth, & offer your sentiments with modest diffidence—opinions thus given, are listened to with more attention than when delivered in a dictatorial stile. The latter, if attended to at all, altho they may force conviction, is sure to convey disgust also. P.S. The letter you sent by Mr Powell for Nancy was forwarded next day to Doctr Brown, for the best conveyance that should offer from alexandria. 7. "This note is to warn you of a diabolical plot." Ronald Reagan was still governor of California in 1972, but his note to Nancy on their 20th wedding anniversary may just be the single greatest letter of all time. This note is to warn you of a diabolical plot entered into by some of our so called friends - (ha!) calendar makers and even our own children. These and others would have you believe we've been married 20 years. 20 minutes maybe - but never 20 years. In the first place it is a known fact that a human cannot sustain the high level of happiness I feel for more than a few minutes - and my happiness keeps increasing. I will confess to one puzzlement but I'm sure it is just some trick perpetrated by our friends - (Ha again!) I can't remember ever being without you and I know I was born more than 20 mins ago. Oh well - that isn't important. The important thing is I don't want to be without you for the next 20 years, or 40, or however many there are. I've gotten very used to being happy and I love you very much indeed. Your Husband of 20 something or other. 8. "Our total love for you is everlasting." Betty Ford was diagnosed with breast cancer just a month after her husband took office. While she debated whether or not to discuss her illness publicly, Ford wrote her this letter of encouragement and support. Afterwards, the first lady would help raise awareness for breast cancer and later, after struggling with alcoholism, found the Betty Ford Center. No written words can adequately express our deep, deep love. We know how great you are and we, the children and Dad, will try to be as strong as you. Our Faith in you and God will sustain us. Our total love for you is everlasting. We will be at your side with our love for a wonderful Mom. 9. "So full of just and generous sympathy." Just under two years before slavery was abolished, a group of Massachusetts schoolchildren petitioned Abraham Lincoln to free all slaves under the age of 18. The president was so moved by the 195 signatures (which he dubbed the “Little People’s Petition") that he replied immediately. This letter sold for $3.4 million in a 2008 Sotheby’s auction. 10. "I've come to the conclusion that you are an 'eight ulcer man on four ulcer pay.'" When critically reviewing a performance by the only child of the president, it’s probably best to go easy. In December 1950, President Harry Truman’s daughter Margaret held a concert in Constitution Hall; while most agreed that the young singer lacked real talent, she was well-liked and supported. Except by Washington Post music critic Paul Hume, who in his review said (among many other things) that “Miss Truman cannot sing very well.” Harry was unhappy. Just how unhappy is probably best illustrated by the letter he sent Hume. Don't forget to check out the upcoming Letters of Note book!